It was 1984 and engineers at General Motors’ Oldsmobile brand had just finished designing and developing the Quad 4 engine – an advanced four-cylinder engine with direct injection, dual overhead cams and four valves per cylinder. Keen to show off what their new engine design was capable of, the Oldsmobile engineering team, led by Quad 4 head engineer Ted Louckes, convinced GM’s top brass to let them build a prototype engineering vehicle that would showcase the engine. As the engineering team got to work on the engine and deciding on what chassis to use, Ed Welburn, who was the head of design at Oldsmobile at the time, began sketching designs for the car, which would be called the Aerotech. Inspired by aerodynamic Le Mans racers like the Porsche 917 LH, Welburn drew up a slippery-looking streamliner with a cab forward design and a long tail. Welburn’s design was well-received, but it was refined after testing in the wind tunnel, with GM aerodynamicists changing up the nose and moving the air intake pods to the sides of the car. Two versions of the car were also designed, a Long Tail and a Short Tail, which can both be seen in the black and white photo below. The Aerotech’s sleek body would be dropped overtop of a modified March 84C CART chassis with a turbocharged version of the 2.3-liter Quad 4 engine sitting midship. The modified four-cylinder made over 900 hp and was paired with a five-speed manual transmission. With construction of the car complete, GM employed legendary IndyCar driver A.J. Foyt to drive the Aerotech. 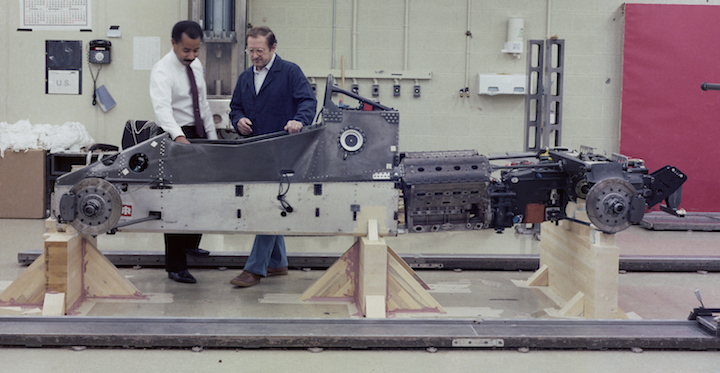 Foyt was skeptical of the car’s potential, but was impressed after an initial test in 1986 showed the car was not only fast, hitting speeds of around 220 mph, but also very stable at speed. The Aerotech set the closed course record a year later in 1987, with Foyt averaging 257.123 mph on a test track in Fort Stockton, Texas. The Aerotech also hit speeds of over 290 mph down the straights in the test. Check out the short in-period documentary about the Aerotech embedded above for more information on this awesomely cool GM development vehicle.